This innovative fly mask with full face mesh comes with air stream fabric on the ears to provide flexible protection against flies. It also provides a barrier against dust and airborne particles. The mesh fabric provides up to 90% UV protection, helping to prevent sun burn and sun bleaching. Ergonomic shaping and fleece padding along the seams keeps the fly mask away from the eyes and reduces gaps. Adjustable touch close safety straps allow for a snug fit. Unfortunately I returned the fly mask although it was a nice one. The reason was it did not have a hole for the forelock. I love the material used in this fly mask and the way it fits. Pacha loves his new fly mask. This is my 2nd purchase of this fly mask. The sheepskin lining and elastic edges make it very comfortable for my horse and the fine mesh makes it easier for her to see. My 1st mask only lasted one season (and several washings) before the mesh started to tear, but it's such a great design that I ordered again. I am glad that I read the reviews for this mask. They do run large. I bought the cobb size for my 3 QHs. They fit ok, but the mask comes a little too close to their eyes. I wish there was a little more room in the mesh area in front of their eyes. I cannot make them looser or they will be able to get them off too easily. I also wish they came down a little farther on their noses. 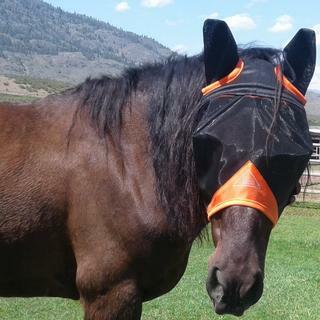 Love these fly masks, the horses don't mind having their ears covered and they can see clearly. If they happen to get left on at night it is not a problem. But the horse size is too large for my horses which are large quarter type animals. When fastened very little of the velcro is actually attached together. I cut off the excess and sewed the end of the velcro so that the dangling part did not get dirty and flop. They still occasionally lose them...I would not order the horse size unless you have a horse with a very large jaw or head. I particularly like the mesh viewing area rather than the standard "hard material" because I believe that my older horse can see much better through the mesh. I don't like the seams associated with the top (forehead) area because I fear that they will invert and become an issue with the eye area; however, that has not happened yet. I've been using the mask for about a week with no issues other than the mesh tends to accumulate small weed seeds, such as foxtails. I liked the light weight fine mesh on this fly mask and the way it is reinforced with the framing on it so it wont wrinkle into the horses eyes like some other light weight ones do. I have purchased two of these masks before. I really like these masks. Horse's vision is clear and not obstructed. Flies have not been able to get inside the mask and you can check your horses eyes without removing the mask. What colour is this. Says black. But picture shows orange? Is there orange? I bought this to donate to a local horse charity..I ordered black and rec'd black. If orange is one of the choices. My horse has a large head, How big will the full size fit? I think he will need an extra large. BEST ANSWER: I have 7 horses all of whom wear the Horse size Shires mask. They range from a fine boned thoroughbred to a large Hanovarian. The mask fits all of them well. Love this product! The full size is quite large! Unless you have a draft ...I would stick with full size. The full size will fit horses approximately 800-1100 lbs. Difference in full and cob? How does the closure work. Will this stay on when horse in pasture with many other horses? BEST ANSWER: This mask closes with two adjustable velcro straps under the jaw. They stay in place quite well, but of course whether it will in pasture depends on if the horses turned out together pull at each other's clothing or not. I have breakaway halters on over these fly masks for my 3 horses that are all turned out together. They have been wearing them for a few weeks without getting them off. They have gotten other masks off in the past.